NORRIDGEWOCK — The votes are in and the Cpl. Eugene Cole Memorial Bridge has been named Maine’s favorite bridge of 2019 in a recent social media contest hosted by the Maine Department of Transportation. The “Bridge Bracket Madness” contest, which the transportation department planned to coincide with NCAA college basketball’s March Madness tournament, asked Mainers to select their favorite bridge, starting with a field of 16 at the beginning of the tournament. Residents could cast their votes by “liking” photos of each bridge on the department’s Facebook page. Over the course of the last few weeks, the bridges were narrowed down bracket-style to two that faced off in a championship match-up Monday: the Deer Isle Bridge, between Deer Isle and Sedgwick; and the Cpl. 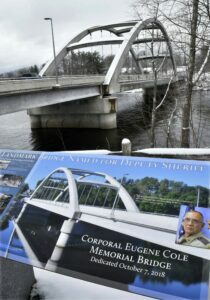 Eugene Cole Memorial Bridge, in Norridgewock. (Virginia beat out Texas Tech in overtime in Monday night’s actual NCAA championship game). 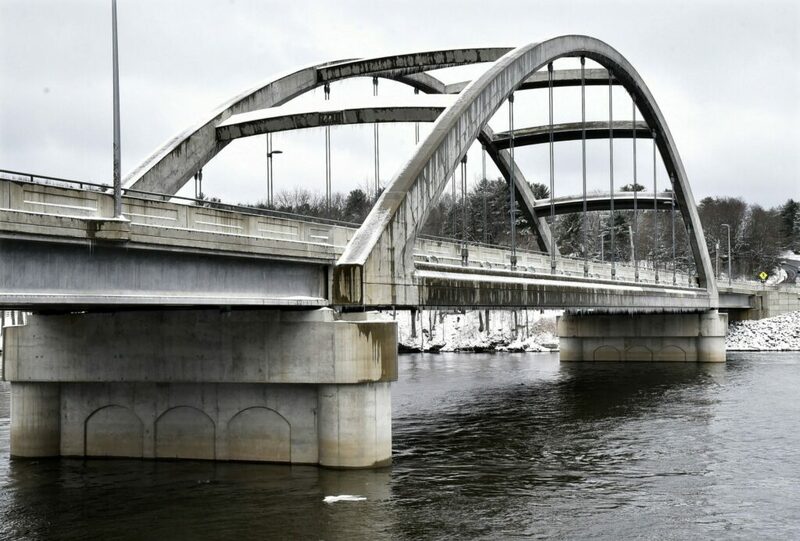 More than 5,000 people voted in the Maine bridge match-up, which the Norridgewock bridge won by a margin of about 700 votes — 3,000 to 2,300, said department spokesman Paul Merrill. The bridge won’t receive any extra funding or accolades other than bragging rights for its victory, but Merrill said the contest was a fun way of engaging people with the transportation department on social media. The agency picked up about 700 followers across Facebook, Twitter and Instagram over the course of the campaign, he said. The 16 starting bridges were selected based on their history and perceived popularity among employees at the department and not by any scientific method. It was clear from the beginning the Norridgewock bridge would go far, Merrill said. The bridge, which spans the Kennebec River, was dedicated in October to Cpl. Eugene Cole, a Somerset County Sheriff’s deputy who was shot and killed in April 2018 while patrolling in Norridgewock. Norridgewock Town Manager Richard LaBelle said since then it has taken on a special meaning for residents as well as people throughout the state. The bridge “seemed to be the one to beat” throughout the contest, Merrill said Tuesday. “Even yesterday it was the clear victor all the way through,” he said.